Bo Pelini won a lot of games at Nebraska, going a very solid 67-27, but he also stepped on a lot of toes. Ultimately his program seemed like it wasn’t gaining momentum, and he never came close to any signature wins. Worse still, his Nebraska teams seemed to wilt in the toughest games, going 9-16 against Top-25 opponents, and they were just 2-8 in his last 10 against ranked teams. Even with Friday’s comeback win at Iowa, it wasn’t enough to save his job, as the former defensive coordinator was canned Sunday. Where Nebraska turns next will be very interesting. One candidate I expect to get a lot of consideration is Oregon offensive coordinator Scott Frost, a former Nebraska QB. Frost would fire up a fan base, as he is one of their own (he was even born in Lincoln), while also representing a return to not only the Tom Osborne era of a dominant rushing attack, but it’d be one souped-up thanks to all his time working with Chip Kelly, who is right now the hottest coaching brand in all of football — not just for his offense but for his entire innovative approach to all facets of the game. In the past four seasons, the Ducks have ranked nationally No. 5, No. 3, No. 9 and No. 24 in rushing offense while also not ranking lower than fourth in scoring. Another big chip in Frost’s pocket is the fact that Osborne thinks very highly of him, and the Husker legend’s word still carries weight there. Working against Frost is that, like Pelini before he was hired, he’s never been a head coach, and rarely do schools replace one fired coach with another guy with some similar traits, although I’m told that’s about all Frost seems to have in common with Pelini. If Nebraska does opt to go for a sitting head coach, NU will have some very viable options: Justin Fuente has done a terrific job turning Memphis around. He’s also got connections to Gary Patterson’s TCU program, which isn’t a bad thing these days. And Fuente would likely bring Barry Odom, a standout young defensive coordinator. Two older candidates whose styles would play well in Nebraska are Minnesota’s Jerry Kill and Wyoming’s Craig Bohl, a former long-time Husker assistant. Kill’s 53 — probably younger than most assume — and has led the Gophers to an 8-4 season that included a win in Lincoln last week, and his success in the Big Ten won’t go overlooked. The 56-year-old Bohl, a former NU DB, won three national titles at North Dakota State with a bruising style that mirrored what he’d learned in Lincoln. He took the Wyoming job last winter and went 4-8. I’m told he did decline some other interest for FBS jobs, but would he be able to pass up the Huskers? Doubt it. Another sitting head coach who would look like a good style fit is Air Force’s Troy Calhoun, who is 48 and riding a very strong season where his team is 9-3 and just beat Colorado State. He’s actually a lot more than just a triple-option guy, too, having been an NFL coordinator. He’s also taking Air Force to its seventh bowl in eight seasons. That is a very impressive accomplishment. The coach Calhoun just beat, Colorado State’s Jim McElwain, figures to be on NU’s radar too. He’s 53 and 18-8 the past two years. He’s also spent three seasons in the Big Ten while at Michigan State a decade ago. Matt Wells is another guy on a lot of people’s radars. He has only been a head coach two seasons at Utah State but has impressed a bunch of folks, going 18-9. The 41-year-old won nine games again this season despite having to start four different QBs. A wildcard could be Oklahoma State’s Mike Gundy. He’s 82-44, only 47 and has had a lot friction with OSU brass. Word is, he’d be very interested. Question is, would AD Shawn Eichorst want him? I’d be surprised if most of the guys on this list weren’t very tempted. Nebraska is a big job with excellent support, facilities and tradition. The recruiting base, though, is not strong relative to other traditional powerhouses. The expectations are also extremely high given how great Osborne’s teams were. Times, and the sport, have changed to some degree. That said, the Big Ten did NU a favor when it shook up its divisions and put the Huskers in the much easier West division — away from the programs most known as the conference’s typical heavyweights. Here is my FOX Four ballot. Not a lot of movement up top, but plenty of shifting in the bottom half. 1. Florida State: Jameis Winston was dreadful throwing four picks, but rising star Dalvin Cook was superb. Yeah, FSU had its hands full with archrival Florida, but I’m keeping the Noles No. 1 because no one else in the country has managed to find a way to win EVERY game. 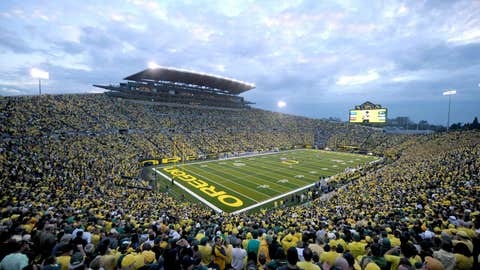 College football offers some of the most unique and majestic settings in sports. Take a walk through a handful of the best stadiums America has to offer. 2. Oregon: The Ducks went to archrival Oregon State and won by 28. They played five Pac-12 road games and won by an average of 16 ppg. The Ducks have three strong wins (over Mich. State by 19 and on the road at UCLA and Utah, and neither of those were close either). I give Oregon a slight edge over Bama. I think the Tide have the better D, although it didn’t look very good against Auburn this week, but I think Mariota is the best QB in the country and I have more faith in their offense on a neutral field than Alabama’s. 3. Alabama: Archrival Auburn rolled up a whopping 628 yards on the Tide in Tuscaloosa, but Amari Cooper was fantastic and Bama still won in a 55-44 shootout. Bama has two very good wins at home (over the Tigers and Miss. State) and their win at LSU is looking better. 4. TCU: I know Baylor has the head-to-head win over the Horned Frogs, and maybe I’ll flip the Bears above TCU next week if they handle K-State. TCU thumped Texas on the road while Baylor got all it could handle at home from a shaky Texas Tech team. I suspect this weekend gave a lot of folks pause on automatically having Baylor ahead of TCU. 5. Baylor: See above. Bryce Petty’s health status (concussion) after leaving the Tech game is also worth monitoring this week. 6. Ohio State: Beating archrival Michigan is always nice for the Buckeyes, but losing star QB J.T. Barrett for the season due to a fractured ankle after having already lost Braxton Miller for the season to injury is brutal. Can Tom Herman and Urban Meyer beat a good Wisconsin team with (former third-stringer) Cardale Jones? 7. Arizona: After beating ASU, the Cats vault to the top spot among two-loss teams. No one has a better win this season on their resume than winning at Oregon. Beating the Ducks twice — and for a third time in 13 months — would be a heckuva statement. Still, they’re going to need plenty of help to sneak in the Final Four. Most viable scenario for them: beating the Ducks, having OSU lose and having K-State beat Baylor. 8. Wisconsin: The Badgers, behind the fantastic Melvin Gordon, have won seven in a row, with good wins over Nebraska and Minnesota. Only one of those seven opponents has a losing record. 9. Miss. State: Dan Mullen’s team was beaten by archrival Ole Miss in Oxford and has looked much shakier in the second half after getting off to the terrific start to 2014. 10. Michigan State: The Spartans look good on both sides of the ball, but they have two losses and their best win is over 9-3 Nebraska. Big win for Ole Miss, defeating the Rebels’ archrivals Miss. State. Coupled with the victory over Alabama earlier in the season, the win gives Ole Miss two wins over teams ranked in the top five this season (when they played). Not bad for third-year coach Hugh Freeze, who a source told me over the weekend intrigues Florida brass as it looks for Will Muschamp’s replacement. As I reported Sunday morning, Kevin Wilson is being retained by Indiana for 2015. The Hoosiers defeated Purdue Saturday to finish 4-8, but sources told me that the school was encouraged that the program showed some progress and ticket sales were up. Hats off to Ralph Friedgen, who got a measure of revenge against his old school this weekend. The long-time former Maryland head coach, now the Rutgers offensive coordinator, returned to the place that canned him from his alma mater after winning ACC Coach of the Year honors and going 75-50. On Saturday, he helped RU rally from a 25-point deficit and put up 491 yards of offense in a 41-38 win by helping Gary Nova to a 28-of-42 performance for 347 yards, four TDs and zero INTs along with 8-of-14 on third downs. Miami couldn’t have finished the regular season on much of a worse note than with the Canes’ home loss to Pitt, extending UM’s losing streak to three with back-to-back duds after last week losing by 17 to a 4-6 UVA team. Al Golden and the Canes can no longer use youth as an explanation for their struggles. This was Golden’s fourth season at UM and to end up at 6-6 was bad enough, but it’s even worse that five of those defeats came by double-digits. Worse still, Golden’s team is 8-10 in its last 18 games and nine of those 10 losses were by at least 10 points. I like the hire by Buffalo of Wisconsin-Whitewater’s Lance Leipold, who’s won five Division III national titles. We’re reporting that Leipold agreed on Sunday afternoon to become the new head coach there. Washington State, again, struggled on defense and finished 3-9 in Mike Leach’s third season there. A source tells FOX Sports that DC Mike Breske has been let go, as has OLB coach Paul Volero. The Cougars ranked No. 100 in total defense and No. 118 in scoring defense. I’ll have more on Wright later this week, but his production has been ridiculous this season. Consider this: In the month of November alone, he had 62 tackles, 14 TFLs and six sacks. College players are often defined by how they perform in big rivalry games. That should be true for Michigan QB Devin Gardner even though his team lost the past two seasons against archenemy Ohio State. Gardner’s stats in the games were pretty impressive: 54-of-77 for 684 yards with six TDs and one INT plus a rushing touchdown. But I’ll remember Gardner for two windows into his character that occurred in the rivalry game. Last season, Gardner was terrific against the Buckeyes even though he suffered a broken foot in the third quarter and gutted through it. This year, it was someone else’s injury that revealed a side of Gardner. Ohio State freshman J.T. Barrett was down on the field for minutes before being carted off the field. One of my lasting memories of Gardner — this one — was summed up perfectly by the Detroit Free Press. From Clemson to Oregon to Texas A&M, here's a look at the top threads in the game right now. Keep this note in mind as Ohio State faces Wisconsin in Indy for the Big Ten title: Including the 2011 and 2012 Big Ten title games, the Badgers have won 11 straight in the state of Indiana by an average margin of 23 ppg. This one was sent in by a reader in Georgia: In the two years Mizzou has won the SEC East, the Tigers’ only win over a team with a winning conference record was when they beat UGA last season. After Marcus Mariota’s six TDs Saturday, he now has 124 total TDs (99 passing/24 rushing) and just 12 INTs in his career. Bruce Feldman is a senior college football reporter and columnist for FOXSports.com and FOX Sports 1. He is also a New York Times Bestselling author. His new book, The QB: The Making of Modern Quarterbacks, came out in October, 2014. Follow him on Twitter @BruceFeldmanCFB.